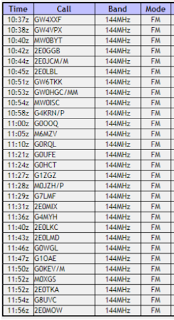 M0PLA/P SOTA Activations: 29th June 2018. Snowdon GW/NW-001 SOTA Activation visit. 29th June 2018. Snowdon GW/NW-001 SOTA Activation visit. Grid SH 609544 Altitude 1085M. It was time for our annual Birthday trip for me and my team to Snowdon. We had the same group as last year, Jamie (M6SZF), Amy, Rick and Myself Paul (M0PLA). We set off from home (Telford) at 05:30a.m. and headed towards Wales on the A5. The weather was fantastic and 12 Degrees as we left home. We arrived at Pen Y Pass at 07:42 a.m and the temperature was 18 Degrees already looked to be a great day. We had a problem with parking as the Pen Y pass car park was full. We had to travel another 3 miles or so to an alternative car park. No problems as we were told there was a local Sherpa bus route. We stood at the bus stop with about another 15 - 20 people and waited like 40 minutes and still no bus arrived. Out of sheer luck a taxi pulled in and I pounced on him straight away. We managed to get all four of us to Pen Y Pass for £6. We managed to start our assent at 08:55 a.m. we were all in very good spirits as last year on the same day it was raining. After an hour of walking in the hot day we all wished for rain lol. We had plenty of water with each person carrying 1.5 ltrs and an additional 2 bottles of 1.5 ltrs carried between us. I think we all drank the bottles we carried by the time we reached the summit and split the spare bottles between us before the Descent. We arrived and had set up by 11:35 a.m. local time and started to call CQ SOTA on 2M FM. First contact was Bruce GW4XXF, followed by a good friend Allan GW4VPX. I felt like I was back where I was suppose to be "on a Summit playing radio". 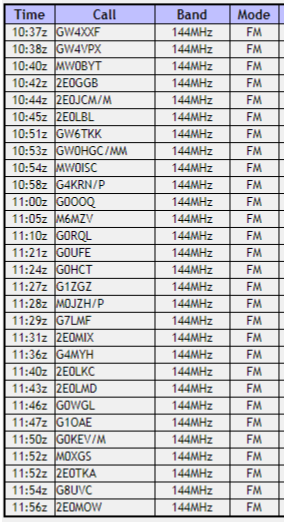 I managed to bag 29 QSO's before the end and my furthest ever contact on 2M FM, I heard a voice coming out of the radio saying Devon, I thought no it cant be lol it was Don (G0RQL) from my calculations that is 151 miles. Thank you all for a great day and the Birthday wishes that you sent me. A special thank you to my team for making sure I was safe. See you all on my next Summit soon.